Home News Athens Square Park is Almost Ready! Athens Square Park is Almost Ready! A year ago, the New York City Parks Department began construction on the plaza at Athens Square Park. Slated to go under repairs and renovations that totaled $850,000, the park is now nearly complete and will be open again for locals to enjoy within the next few weeks! The park has always been a symbol of Greece, and the hundreds of Greek immigrants that call Astoria home. The park is filled with statues of important Greek figures, like Athena and Sophocles. Located right near Henry David Thoreau Elementary, the park is a place enjoyed by many children, as well as their parents. It’s a great picnic spot, or simply somewhere to go and enjoy the sunshine. The new additions to the park will include a diagonal checkerboard pattern – which draws inspiration from Athens’ Odeon of Herodes Atticues theatre. 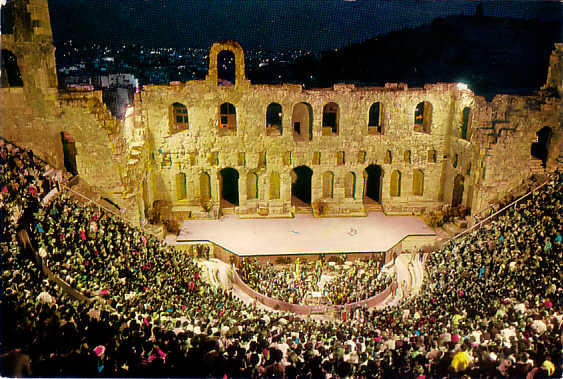 The theater dates back to 161 AD. The performance area, where many concerts are held, will now resemble the Sun of Vergina, a well known Greek symbol. We can’t wait to see the updated park! Previous articleBasil Brick Oven Pizza! Next articleNature’s Taste is Opening Next Week!